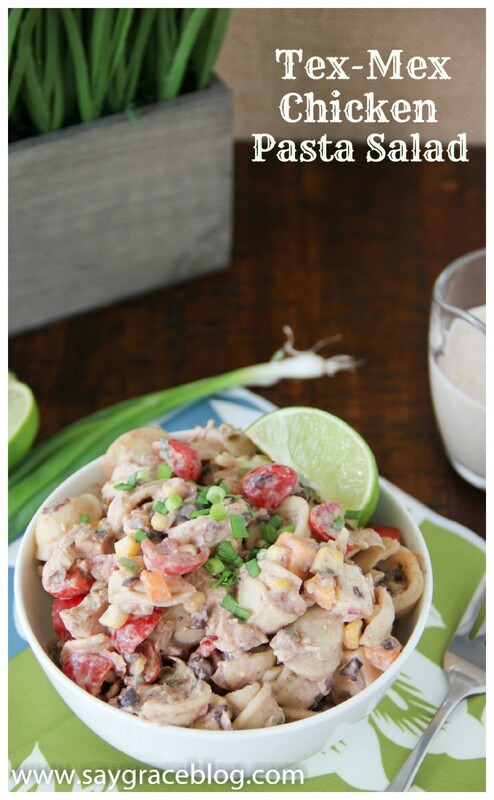 Your summer classic pasta salad with a Tex-Mex twist! 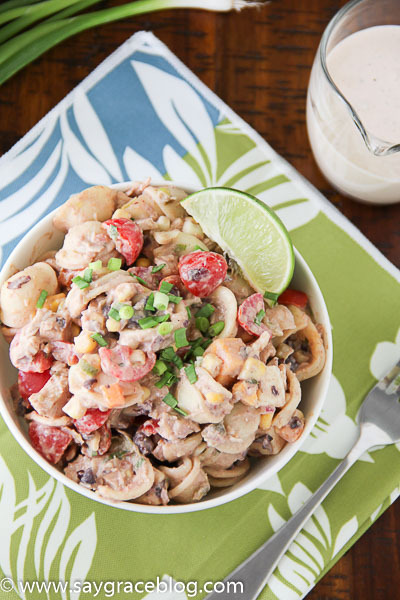 Serve this Tex-Mex Chicken Pasta Salad at your next shin-dig and your guests will be begging for more! I combine all of the traditional, yummy Tex-Mex flavors with chicken and pasta to create an entire summer meal. You’ve got your protein, your starch and your veggies conveniently served together so it’s no must and no fuss! Served either room temperature or chilled, this is an easy “go to” meal in the dog days of summer when you don’t need a hot oven on all day to prepare lunch or even dinner. Remember when I said that hubby isn’t a big fan of pasta salad? Well he’s a big fan of this version! He said that it was a lot better than he expected as pasta salads go! SCORE! Sweet! I love it when I surprise him! 🙂 It’ bursting with lots of flavor which is probably why he enjoyed it so much! I combined orrecchiete pasta with roasted chicken breast. By the way…make sure that you roast your bone in skin on chicken breast in the oven for the moistest chicken you’ve ever had IN LIFE. I always prepare my chicken this way when I need it in any dish. It’s the way to go guys! 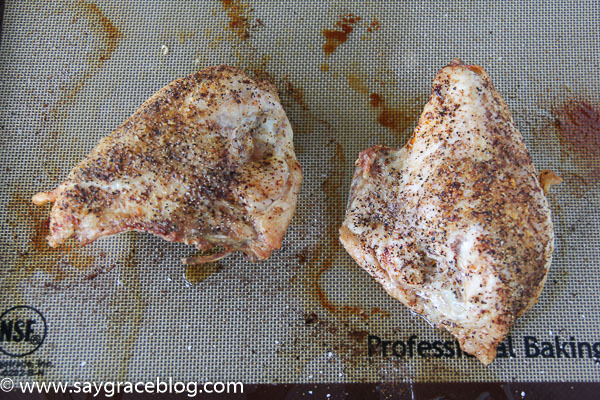 Season both sides of chicken breast generously with kosher salt and pepper. Then sprinkle with cumin and chili powder (to your liking). Roast in a 375 degree oven for 35-45 minutes (depending on the size of your breasts) or until juices run clear. When cool enough to handle, remove from the bone and then remove the skin. Now dice into bite sized pieces. Set aside. In a small bowl, whisk the salsa, sour cream, mayo, garlic, chili powder, cumin, salt, pepper and lime juice until well combined. 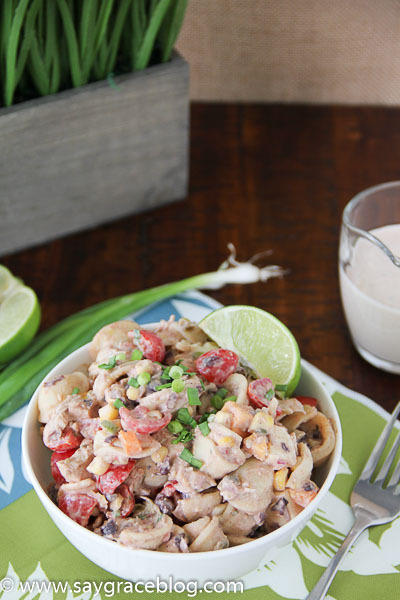 In another bowl, toss in the chicken, orecchiette, corn, beans, tomatoes, orange bell pepper, green onion, red onion, chiles and cheese. Pour most of the dressing over the pasta and toss until combined well. 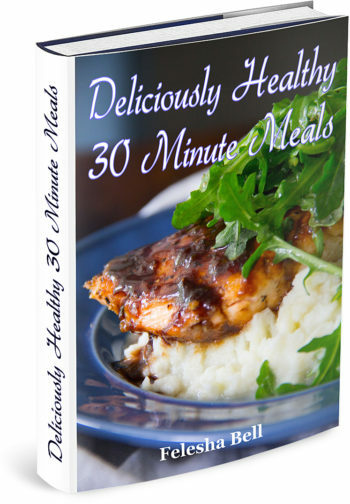 Serve at room temperature with remaining dressing if needed. Say Grace and enjoy! I’m not a fan of pasta salad but this was an awesome surprise. Full of flavor. Thanks Love! Looks good! I love the idea of the creamy mayo with all of those spices! Looks good Felesha. Here’s something to ” chew on “, ( no pun intended ) Most Americans like Meat Loaf. How about YOUR version of meat loaf in a future blog Felesha ? ?